My life with Lipedema & Lymphedema...destined to be fat. I am excited to be attending my ninth ObesityHelp Conference on August 15-16 in Los Angeles, California. This year’s keynote speaker is MasterChef judge, Graham Elliot. I look forward to meeting him and hearing more about his post-op journey. This year I have the pleasure of co-hosting the #OH2014 Friday Opener Mix ‘n Mingle with Diana Vogel, MS, MFT, Intern. I met Diana last year at #OH2013 and really enjoyed her sessions and her overall personality so I’m really looking forward to leading some activities to help attendees get to know each other. In addition to the support and educational opportunities at #OH2014, there is the socializing and FUN. 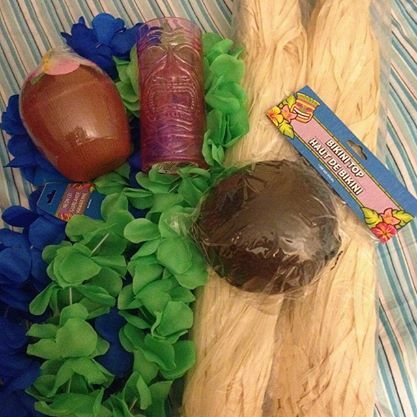 The Friday Night Meet & Greet is Hawaiian Themed and I have already bought supplies for my costume. Anyone who knows me knows I always take part in the costume parties at conferences! I look forward to seeing all my OH friends again, and making new friends at #OH2014! Part Two of my The Bias Among Us series, read Part One The Bias Among Us – Success? 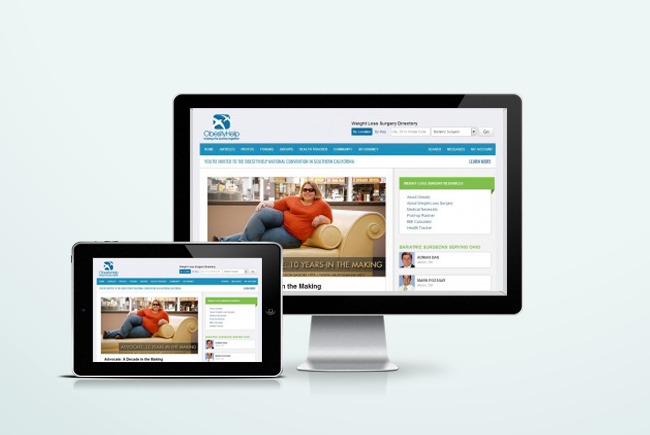 I have always received the majority of my post-op weight loss surgery (WLS) support online. I initially met most of my WLS friends on ObesityHelp, then had the pleasure of meeting them in person at ObesityHelp events. I have attended eight ObesityHelp events and two Obesity Action Coalition events. Most event attendees will tell you that one of the BEST parts of events is meeting other people and socializing. I know that even after 10 years in the community I enjoy events for the opportunity to catch up with old friend and to meet new friends. However, recently there has been some very disturbing incidents that have happened to me, and other long term post-ops that need to be discussed. Not much bothers me in life, but this is one of them, mostly because it totally zaps my mood, in the midst of enjoying life, socializing with others who “understand” the struggle of living with obesity I am reminded that some people still see me as just FAT, people who cannot see past my FAT to get to know the REAL me, to ask about my REAL journey, yet these same people claim to be “helpers”. 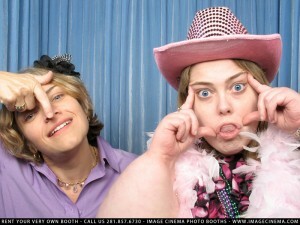 Last year at the inaugural OAC Your Weight Matters convention in Dallas, I meet many new friends. *wave* On the very first day of the conference a group of us were sitting in the lobby talking about our lives, not weight loss surgery, not weight…actually I have a very good memory, I was talking to another Sarah (spelled correctly with the H) about my job as she also worked in healthcare and was familiar with a company with whom I had just received a recruitment call. Suddenly, there was an interruption to my left, it was someone to whom I had never met asking me if I was pre-op and considering weight loss surgery, she came equipped with a pamphlet all about herself and her journey. She continued to tell me all about her weight loss, and how many support groups she speaks to about her journey. It was her sales pitch. Sorry I’m not pre-op, I”m actually many years post-op, yes I’ve regained. Yes, I know that despite having RNY and a revision I am still morbidly obese and qualify for surgery. I whip out my phone show my before picture, then quickly explain Lipedema and show my legs pictures and hope that’s enough to convey that I’m not buying what she was selling. And it was obviously enough because the person never interacted with me again the entire weekend. To me that showed her REAL intention was self promotion, not meeting me or getting to know me. If she really cared to know me, or the others sitting there, she would have engaged in the conversation, not interrupted then leave as soon as her sales pitch failed. This was further confirmed at the recent ObesityHelp Conference in Anaheim when the same person did not make any effort to engage in conversation with me, even after I reintroduced myself. At the end of the very same conference it happened again. After walking my lap at the Walk from Obesity I went inside to warm up, Dallas was FREEZING that morning. So there I sit in my tutu and tiara and I’m approached by a fellow WLS patient and asked if I’m considering surgery, or am pre-op. Honestly, I don’t remember this conversation as much because I instantly started fiddling with my phone to pull up pictures. Why should I have to do this? I guess I don’t, I guess I could just be as rude as these people are and say something back to them verses explaining that yes I once weighed over 500lbs, see I used to be REALLY fat, now I’m just FAT FAT. I prefer the educational route, and at least this person was not trying to “sell” anything to me, they appeared to be genuinely concerned and/or interested in me and appreciated that I educated them about lipedema and lymphedema. It is also troubling because the OAC Your Weight Matters Convention is NOT a weight loss surgery focused event, it is educational about healthy weight loss options, and advocacy for obesity. One of my favorite parts about the OAC is the work to make sure individuals have access to weight loss options “when they are ready.” During the weekend I met many professionals in the weight loss field, and not one of them approached me me to discuss my weight, so neither should regular attendees. But Sarah, that was LAST year, get over it already, you’re too sensitive, these people are just trying to HELP. No, actually some people are trying to get paid. 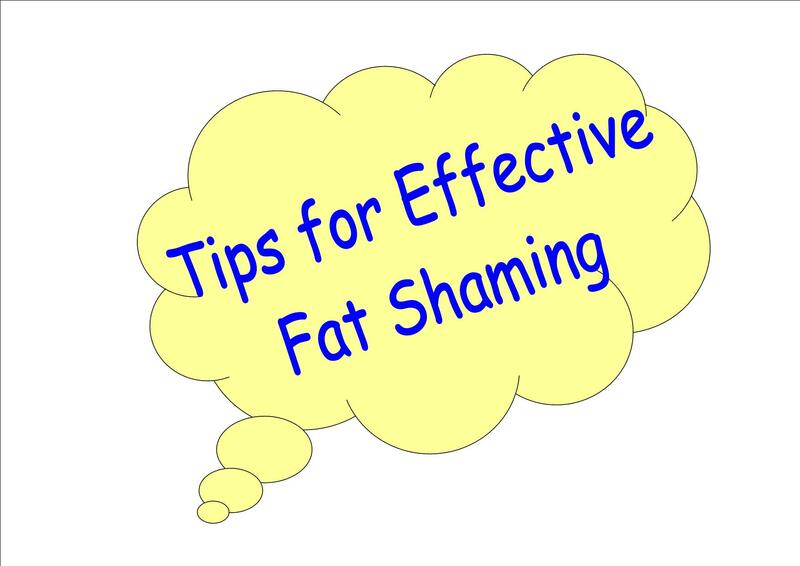 I was recently scolded for speaking up against a comment I believed was stigmatizing against FAT people. I was told the person’s intentions were to help people, she has “found health” and just wants to pay it forward. Least we forget where we came from? I remember it fondly because I am almost back to where I started. Again the person trying to “help” also has a business marketed to post-op WLS patients, so let’s not confuse paying it forward to getting paid. I too have “found health”, my health might LOOK different than others’s perception of health, but I am healthy and I too help others. I have actually helped others for years to navigate the insurance process in order to get weight loss surgery and post-op plastic surgery covered. There is no weight or size requirement to help others, nor does losing 100lbs automatically qualify as a profession. There is no weight or size requirement to help others, nor does losing 100lbs automatically qualify as a profession. That recent experience is only one of the reasons I chose to finally write about this topic. Sadly, I have heard of several other incidents like the ones I experienced in Dallas, at other WLS events. Stories of long term post-ops or mid-journey post-ops being approached by fellow WLS patients and questioned as to why they have yet to reach “goal” weight (which who knows what someone else’s GOAL weight is????) or why the person hasn’t addressed their regain. Of course the person was ready to “help”, here just sign up for my program. I have invited many long term post op friends to events in their areas only to be told “Oh, I’d LOVE to go, but I can’t, I’ve regained so much I’d be too embarrassed.” Regain happens, it is more common that most think or want to accept. Regain is also the very reason to attend an event. Events can provide education, rejuvenation, and motivation. 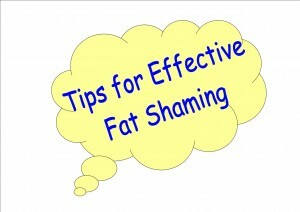 However, all that can be diminished by a well intentioned person speaking inappropriately to someone about their weight. While I am strong and will just speak up about it and blog about it, it could and does really upset others. I’m sure many of you reading this will be able to guess who these people are, I am sure their intention are to help as I am sure there are people who would benefit from the type of helpful services they offer. I am just not one of those people, and I feel obligated to point out the approach is inappropriate. If you want to help people do not shame them, also do not dismiss ME as a fellow WLS patient just because I am not a pre-op or in need of your services. You’re missing out on a potential awesome, cool, and funny friend. Most people who take the time to get to know the REAL me would agree, if not I’ll just delete their comments. On the serious note, this is me being helpful. There is nothing wrong with wanting to help others, or starting a business to do so, however if you are going to enter into “people helping” career, you need to work on people skills. As I stated before, I dislike being approached by strangers about my weight. However, being approached by fellow WLS patients is even more upsetting. The WLS community is supposed to be one of support where people “understand” what it’s like to be obese. If you know what is it’s like or remember what it was like you know how mortifying it would have been to be approached about your weight. Also, in the WLS community you do not know if the person is pre-op, newly post-op, started at 500lbs and has lost 200, etc. We all come in so many shapes and sizes you cannot tell where we are in the journey by looking at us. Get to know the person. How can you help someone if you do not know them, know their story, where they are on their journey, their struggles? That is the question to ask “Where are you on your journey?” I was recently asked this by a vendor at an event and it was the perfect way to find out how their product might be useful to me without them making an assumption about me based on my appearance. This year at the OAC Convention in Phoenix I once again met many many news friends. 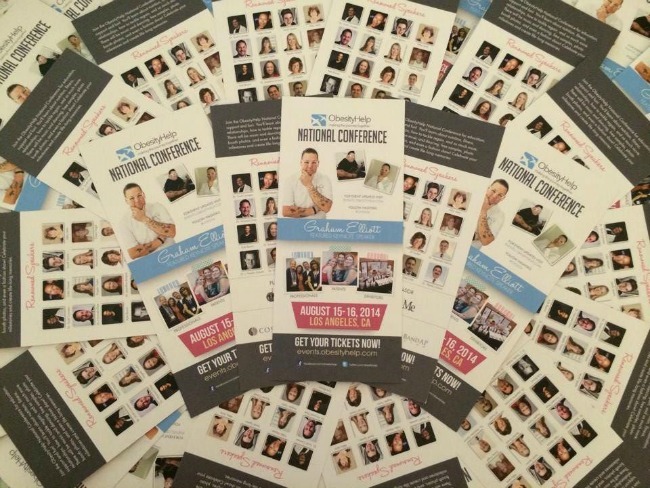 Several who do have businesses or are speakers in the community, but that was not their “pick-up” line, we actually had conversations about ourselves, our lives….the real roots of a support community. National Health Blog Post Month – Day 9: Just admit it! It’s taboo. Write about something that people do but don’t like to talk about or won’t admit to doing. Nothing stirs up debate within the weight loss surgery community like a discussion about drinking diet soda. Rumors and scare tactics surround the consumption of carbonated beverages from being the cause of regain to causing pouches to explode. Surgeons’ post-op protocols vary on whether or not weight loss surgery patients should consume diet soda. Some surgeons say NEVER, some say whenever as long as the bubbles don’t bother you. My surgeon’s protocol was the latter, actually my nutritionist’s recommendation was I could try diet soda, and if it didn’t bother my stomach I could have it in moderation. So I did, and I do drink diet soda. The moderation part….um not so much. 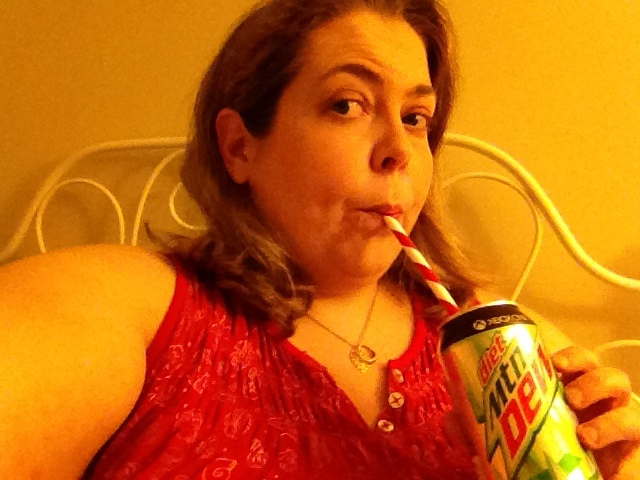 My name is Sarah and I’m addicted to Diet Mtn Dew. There I said it. I admit it. I do not deny I drink diet soda. It is probably my one unhealthy habit. I do not drink alcohol, I do not smoke, let me have my diet soda! I’m not the only one. Yes, I do know many post-ops who have forever given up their bubbly soda. Kudos to you. You are stronger than I, although I’m sure there is something you enjoy, and enjoy probably a bit more than you should. Don’t we all have something we over indulge in? Drinking diet soda is so taboo that many post-ops hide their drinking. Which is odd in a community that so opening partakes in drinking alcohol. At an event a few years ago I actually had a fellow post-op question why I was drinking Diet Coke, when I should be well aware of it’s relation to regain. He was drinking bourbon or whiskey on the rocks. Really? It’s interesting watching fellow post-ops “hide” their diet sodas at events. I’ve seen it poured into cups to hide, or taken in grocery bags to rooms for private consumption. As if there is an “image” to uphold and we must not let others see us being real humans who drink diet soda. When I attend events I drink my diet soda straight from the original bottle or can, and in public. It’s interesting to see others reaction, I was even asked “where I got the contraband?” Seriously, it’s diet soda, not crack. Are we not adults capable of making our own choices? It could be worse, it could be regular soda. Right? I know, the studies say………….. But there are so many chemicals. Excuse me but take a look at the ingredient list on your protein shake. So let’s be real each other, we are humans, we are not perfect…actually I have a confession to make. The other day I mentioned that I took a couple Advil for pain in my legs. I was asked if I ate something with them since NSAIDS are also a supposed “no – no” in the WLS world. I assured the person I take proper precautions, as I also take a daily aspirin for medical reasons. The truth is yes, I ate something…I washed the Advil down with Diet Mtn Dew and two cookies. So tell me, do you drink diet soda? Energy drink? The Bias Among Us – Success? This blog topic is LONG overdue, and actually I have so much to say on the topic I feel the need to make it a series of posts. A couple months ago I wrote about the fat shaming I’ve experienced from strangers, however even more troubling is the weight bias I have experienced within the weight loss surgery community. Let me reiterate I’m not calling any person biased, I’m labeling the actions and comments as biased. I know intentions are often to “help others” but as the person on the receiving end of the comments and actions, I feel it’s my duty to let you know they hurt far more often than help. 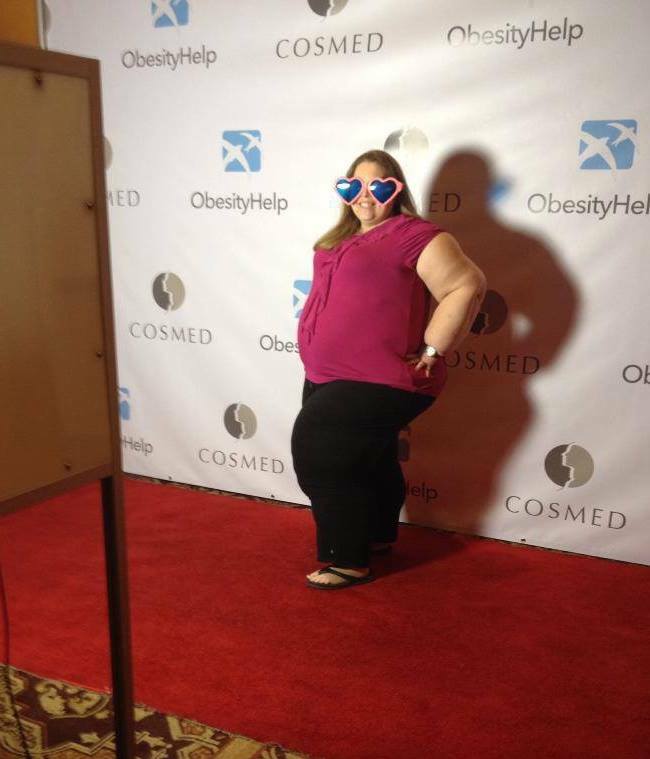 Last month I attended the ObesityHelp #OH2013 Conference in Anaheim, CA, I was a member of the event staff and as so I posted this picture to the ObesityHelp Facebook wall in order to promote the evening’s event. Under the picture I posted “Sarahlicious is warming up the Red Carpet! Are you ready to celebrate your success?” The theme of that evening’s party was “Celebrate Your Success”, I never actually called myself a success, I asked if others were ready to celebrate THEIR SUCCESS. A fellow WLS (weight loss surgery) patient commented on my picture with “success????????????????????????”. I am a success because I am alive after surviving a deep vein thrombosis, mini-stroke, and patent foraman ovale (hole in my heart). I am a success because I have maintained 100lbs weight loss for 10 years, was it more, sure…did I regain, yes! But 100lbs loss is still a success in my book! I am a success because I have completed two bachelor degrees and I’m pursing my Masters in Health Law. I am a success because I no longer have sleep apnea or high blood pressure, all other health vital are and have been normal. I am a success because I love myself, and others love me for who I am. I am a success because I share my story to advocate for and help others. I am a success because I stand up against weight stigma and bias. I am a success because I am winning the battle against disfiguring lymphedema and lipedema. However, I should not have to list my accomplishments or pull out my phone to show others pictures to PROVE I am a success. As a community we need to stop judging ourselves and others based on the scale. We need to stop judging, PERIOD. 1. Extinguish your cigarette – Nothing is more annoying than having someone fat shame you while blowing smoke in your face. So please do not approach me about my weight, and how you can help me “get healthier” while smoking. Yes, it’s happened to me. My boyfriend and I were at the beach, enjoying a cool evening watching the waves and the people roll by on bikes and skates, when I was approached by a woman smoking. At first I thought she was going to ask for money, so I clutched my purse closer to me. Instead she tells me how she has just finished her personal training courses and wanted to know if I would like to work out with her, she could “help” me lose weight. She “understood” how threatening the gym might be to large women, she’d make me comfortable with exercise. “Oh, I know, I’m trying to quit” she says as she quickly tries to extinguish her cigarette. It’s not that her knowledge is invalid because she smokes, it’s the fact that she approached a stranger about their weight, assumed I did not already exercise, which I did and did so letting her own poor habits show. 2. Step away from the bar – Ok, in his defense he was stepping away from the bar, well stumbling away. A co-worker and I were having dinner at a steakhouse when this drunk man stumbled up to our table and muttered “You’re probably going to tell me to f*** off, but I just HAVE to tell you…PLEASE STOP EATING, you are killing yourselves. I work at a hospital and I see people like you die every day”. He did in fact work at a hospital, or at least he was wearing a polo shirt with his name and the name of a local hospital. Fellow restaurant patrons were also horrified by his behavior and quickly approached him and escorted him outside. Then the manager came to the table and apologized for the man (who was a regular bar patron) and comp’d our meals. Ironic. 3. Do not interrupt my workout – Of course someone working out at the gym must be in need of unsolicited advice about how to lose weight. Right? But some people are just overly persistent or working for referral money. Either way it is annoying. As Susan Powers would say “Stop the INSANITY!” There I am, at the gym, ear buds in listening to Destiny Child’s “I’m a Survivor”, when I notice this woman waving at me. I did not recognize her as someone I know, but I take off my ear buds and say “hello”. “2003, I used to weigh more than 500lbs, I have Lymphedema”…trying to think what else can I say to get her to let me get back to Beyonce, Kelly and umm (oh hell anyone remember the 3rd chick from Destiny’s Child?) Michelle! Thanks Google. I tell her that I am very involved in the WLS Community and I am well aware of the options available. I’m too nice, I should have told her how inappropriate her approach and conversation were, despite intentions do not approach strangers about their weight. She of course was a WLS herself, something about having WLS or losing a massive amount of weight through whatever programs makes you a SAVIOR. I must not have said enough Hail Mary’s because I never got my wing and halo. Well I got my batwings, but not my angelic wings and official orders to go out and SAVE people. I understand the urge, really I do, I have the same feeling when I see someone I believe is suffering with Lymphedema in their legs, and having gone undiagnosed for so many years I have good instinct to think they too might be undiagnosed. However, I’m quite sure no one is unaware they are fat? If they are unaware, that is a conversation for a family member, close friend, or doctor to have with them regarding their health. It’s not for a stranger to initiate. If you are concerned about the health of a friend or family member here is an article about how to approach that conversation. 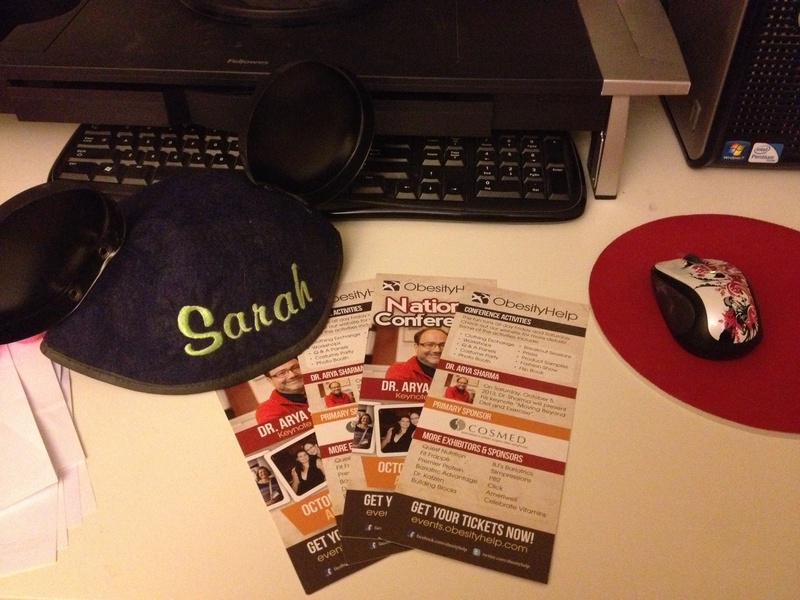 Getting ready for more education, friends, and fun at the ObesityHelp 2013 National Conference in Anaheim, CA, October 4th & 5th. Looking forward to hearing Dr. Ayra Sharma speak, and spending more time with my pal Eggface! I’m also hoping to have time to visit with my college mentor who now lives and works in California, the man truly changed and saved my life! There is still time to join me in Anaheim! This will be my 8th ObesityHelp Event! I like to stay active with ObesityHelp and the weight loss surgery community because I’ve met many fellow Lipedema and Lymphedema patients who have had or are considering weight loss surgery and it is great to meet others with similar experiences. Social Media is responsible for me writing this post. First, I saw a post on Facebook by ZocDoc, which I “Like” because a friend of high school who lives in NYC uses their services and “Liked” them one day, and being in the healthcare profession I wanted to learn more about the company, I liked what I read, especially their service philosophy. So I read this post from ZocDoc about Social Media and Health, and how bloggers can submit their writings on the topics. Hmm, I knew how much I utilized Social Media in my healthcare advocacy to help others and myself, but had I actually written a blog post on the topic of Social Media? No, but I knew I could, so I added it to my “to do” list. Then the next day I saw my new Twitter friend, Rhiann, Tweet about Social Media and Health, and it happens to be a Blog Carnival writing prompt. Awesome! Now, I met her during a Twitter #HAChat hosted by WegoHealth. Leslie at ‘Getting Closer to Myself‘ is hosting the ‘Patients for a Moment Blog Carnival’, and has given the following prompt. 1. Describe your illness in 140 characters. Perfect it’s a Tweet! And to my delight, my normal Lipedema description fit into 140 characters. 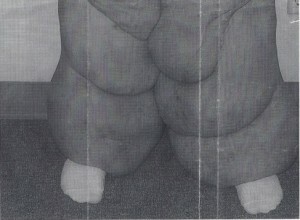 Lipedema: Abnormal accumulation of subcutaneous tissue; primarily in hips, thighs, legs & upper arms. Does not respond to diet & exercise. 2. How has social media impacted your illness experience? I was diagnosed with Lymphedema in 2001, and Lipedema in 2004, before Facebook, Twitter and even “Social Media” were the current means of communication on the internet. At the time I was diagnosed I connected with other lymph patients via Yahoo groups and message boards. I have also been very active on weight loss surgery forums, such as ObesityHelp. I have gained a wealth of knowledge, and many friends via the Internet. The internet has always been a means of support for me. I lived in a small town in Ohio, so the internet provided a means to reach out to people beyond my geographically limits. I then moved to Miami, FL, and the internet provided a way to meet new friends in my area and get healthcare recommendations. In addition to getting support and information from the Internet, I have also given back. I started this blog to share my story and promote awareness of my conditions, Lipedema and Lymphedema. I also am advocating for two pieces of legislation currently in Congress. I was please to find a whole new world of Lipedema patients on Facebook. Until this year I knew only one other Lipedema patient. While I have been maintaining my illness, I had lost hope there was any other new developments in the treatment options or interest from the mainstream medical field. Through the new connections I made via Social Media I learned that in fact there are new options. And I met others LIKE ME, and NEAR ME! And there are plans for a small gathering this October, so we can meet and share our experiences in person. I began promoting my blog by sharing posts on Twitter. It was there I found WegoHealth and began participating in #HAChat. And I realized there is a way to connect with other chronic illness patients, despite our conditions being different in disease, our daily lives share a common experience..typically themed in getting the best and most appropriate medical care for ourselves. Social Media has opened up an entire new world of support, and knowledge. The entire experience has given me a renewed sense of empowerment. I am a healthcare advocate, my goal is help others. Social Media is helping me reach that goal. Dancing for Dollars! Support me in the Walk from Obesity! No tutu until I reach my fundraising goal of $1000! If I reach my goal of $1000 in donations by the morning of the walk, August 18th! I will WALK IN MY SWIMSUIT (and tutu). 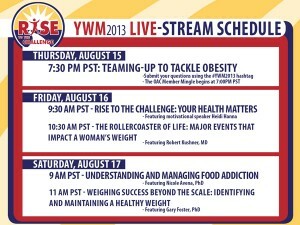 YOU Can Still Be a Part of #YWM2013 – Join Us! It’s not too late to be a part of Obesity Action Coalition Your Weight Matters Convention! Registration will be available on-site August 15th. Join us for a day or the entire event. Can’t join us in Phoenix? No worries there will be 5 sessions live-streamed via YouTube! During the Teaming-Up to Tackle Obesity event, those who can’t attend will also be able to ask questions during the Q&A using http://www.twitter.com/obesityaction and our official #YWM2013 hashtag. This is a great opportunity to experience OAC and get a glimpse of what the information and resources they offer. Check out my Top 5 Reasons YOU Should Attend #YWM2013 and watch for my LIVE updates from the convention on Twitter, Facebook, and Instagram. I am honored to be today’s featured article on ObesityHelp.com – Advocate: A Decade in the Making. I have been a member of ObesityHelp since 2003 and have attended 7 of their events. October 4th & 5th I will attending the ObesityHelp 2013 National Conference in Anaheim, CA. 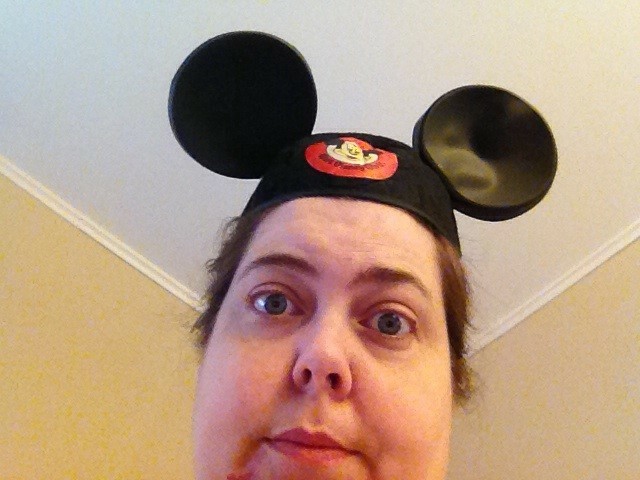 ObesityHelp asked me to share my experience and struggle with Lymphedema and Lipedema. Including fighting for insurance coverage of needed treatments. Both conditions affect individuals struggling with obesity, including those seeking weight loss surgery. Many like myself, are not aware they have Lipedema until after having weight loss surgery and noticing that despite massive weight loss their legs are still abnormally large. Emmie W on Lululemon cannot cover my @ss, and the sky is blue. Lili Jacobson on Too Fat for Fat Acceptance? Infographic: How do compression garments work? Too Fat for Fat Acceptance?